You hear it all the time – for weight loss and better health you need to drink more water. But what do you do if you don’t like the taste of water? Check out our Infused Water Bottle and Pitcher reviews for information on the best flavored water infusers. These portable water bottles are durable and help support your weight loss efforts by encouraging you to drink more infused water wherever you go. Audrey Johns is a weight loss guru who lost 150 pounds in 11 months by cooking and eating real food, and not by demonizing it. She embraced movement, cut out processed food and counted calories. As she lost weight, Johns was bombarded by the question “What are you doing to look so great?” She began blogging on her site, Lose Weight by Eating, and shared her recipes and weight loss tips. Johns’ blog grew a following of over 8 million in less than 2 years. She is now a Food & Wine Journalist, celebrity TV personality, and has a YouTube channel that has had over 150,000 views and 1000 subscribers. The Lose Weight by Eating Facebook Page has a following of over 120,000 followers. 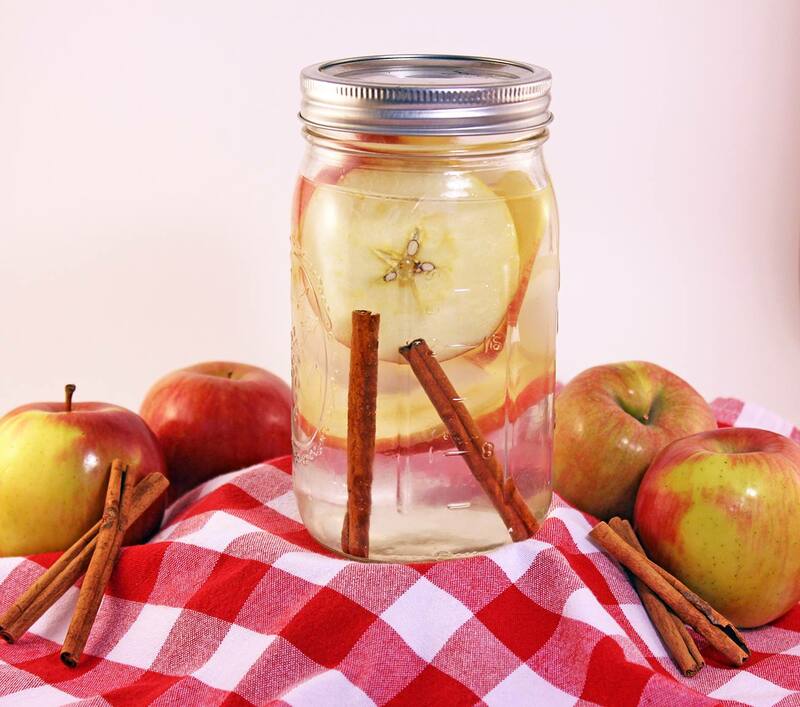 Watch Audrey demonstrate her recipe for the Original Day Spa Apple Cinnamon Water. Check out more fruit infused water recipes, including Ice Cubes, Teas and Sodas all meant to help you drink more water and lose weight in my first cookbook FRUIT INFUSION: A Collection of Day Spa Inspired, Fruit Infused Waters. Where did you get the cinnamon stick? If you can’t find them in your local store, there’s a good deal on a large bag online that we usually recommend. Terrie, the fruit can stay in the water for about 2-3 refills. When it starts to lose its flavor then change it out. Cheers! Do you eat the fruit once the water is gone (for the ones with berry like fruits)? You can, but most of the flavor will have been lost. This may be a silly question but can I/should I eat the fruit? You can eat the fruit, but most likely it will have lost most of the flavor. bought a sedona water dispenser today no recipes or directions can you give me simple suggestions for fruit infused water? HI AUDREY. QUICK QUESTION. IS IT BEST TO INFUSE WITH HOT OR COLD WATER. Both work, but hot is too labor intensive for some people so I often recommend cold. Yes, keep refilling the water until the fruit loses it’s flavor. Which are best to flush ur system or for weight loss? All these are great to flush your system, the cucumber drinks will help to reduce bloat, the drinks with citrus and strawberries boost metabolism. I recommend you try a new drink every week so you never get bored and you keep your taste buds guessing. I just finished my strawberry/peach infused water. Love it, love it! Going to try strawberry/kiwi next! Don’t know why I’ve waited so long to try it!!! I have been very ill for several years but 2years ago I had surgery and became septic. After 17 surgeries, I have very strict physical restrictions so my normal methods of weight loss are impossible. After coming across this site, I decided to give it a try. Couldn’t hurt.I did the.lemon, strawberry mint detox and kept a close eye on my caloric intake and by the next day, not only did I feel refreshed, but I had so much more energy! I have lost 5 pounds in one week and feel so much healthier and happier. Thank you so much for opening up anew door. Thanks for sharing your story. It validates that this method works. I am so sorry for all the illness and surgery you have endured. It sounds like you are on the road to getting well now, and that is wonderful! Are these drinks safe to drink daily? Yes, you can drink fruit infused water every day! Your body will love you for it, and you’ll feel good too. I wondering if the infused water can last longer such as 2 or 3 days? I wouldn’t keep the fruit infused water longer than 2 days as the fruit starts to turn bad, and I would definitely keep it in the refrigerator. My kids have been asking if they can try my infuse water. I have told them no , seen there small , I don’t want to bother theirs tummy. but is there a receipt I can try that my kids can try. Maria, as long as they are not allergic to the fruit you are putting in the bottle, they should be ok to share your infused water. Our year old loves infused water and drinks it all the time. Can i drink infused water if i am breastfeeding? Alba, as long as you’re not allergic to the fruit you are using in the water, it should be safe to drink fruit infused water while breastfeeding. I put tangerines, cucumber grapefruit,an ginger… too strong an bitter…don’t want to add suger what to do..? The best thing you can do to help your weight loss is to drink lots of fruit infused water. You will feel fuller, and infused water helps flush toxins from your system. Also, start following my other blog Lose Weight by Eating. I have lots of weight loss tips and recipes there to help you. Good luck and congratulations for taking the initiative to control your health! Should I limit my intake on fruits. I’m a type 2 diabetic. I got a fruit infusion water bottle today. I was wonder how long I should wait before drinking it once I put the fruit into the water? taste less sweet than sickly bought fruit waters, say if i use berries? hey can i put more than 3 type of fruit in 1 bottle…?? You can put as much or as little as you want. It just depends on how intense you want each flavor. 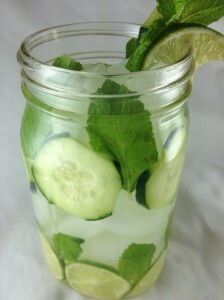 I heard today cucumber infused water is great for your skin, is it the combination of infusing it into the water, because I know what is good for everything:) and is there any other benefits for cucumber infusion for as well? Any infused watet that does not come in bottles is good. Natural or so to say homemade is the best. I find boiling water with apples and cinnamon and letting it cool down on the side really enhances the flavoured water! It’s so great the taste, better than those bottled waters. Hello, what cinnamon did you use for this idea? Was it cinnamon sticks? Yes it was cinnamon sticks. The powder does not work well with this recipe. Thank you. Its amazing to lose weight by drinking infused water. Do we need to boil the water with fruits or just put the fruits in a jar and pour plain water? Please reply. Hi Archana, you do not need to boil the fruit, just put them in the water raw. Is there a certain size the fruit should be when slicing? Also, I made a drink today with Strawberries, Kiwi’s, and Cucumbers; but only taste the cucumber. Why is that? I used Southern Breeze Sweet Tea bag (no sugar, Splenda) and orange slices in my bottle and it was great! I bought my tea bags at Walmart. What’s the best recipe for wanting to lose weight? hello trying to eat healthier and drink plenty of water, I’ve noticed that the weight isn’t coming off as much as I thought probably my eating habits I eat a small breakfast like turkey bacon on toast, I do drink coffee with cream and sugar, a cup of orange juice daily. I really move around a lot at work not at home.. my skin is better due to cucumber and lemon water. I currently suffer from Fibromyalgia and I have gained a lot of weight recently due to medications and trying to deal with fatigue by eating stuff that not appropriate I’m interested in your recepies can you help. You look fabulous!! I’m on Plexus and having a hard time getting all my 100 ounces of water down each day. I bought an infuser and have never used or seen one before. I’m going to try the apple and cinnamon one today! These are amazing! I just purchased a fruit infuser water bottle from infruition.com and I wanted some recipe ideas. If you have a sweet tooth,sweeten your water with Stevia leaf sugar.NO CALORIES!!!!!!! Do you steep the water infusions in the sunlight? And if so, is a specific type of bottle needed to do this? I’ve been eagerly wanting to try it. To lose weight, how much water do I need to drink in a day. How much water do I have to drink in a day to lose weight. Is there a book that includes all these recipes or a printable version. I would gladly pay for them they are so good. is it ok to drink this in a school?